Live Glass interprets the colorful shadows produced by stained glass found in the Isabella Stewart Gardner museum and transforms them into a wearable piece that can be experienced by both the model and the audience. This wearable looks at color and light and the relationship between the two when water is added. The piece is made up of three parts: a central frame that holds the “stained glass” pieces, the “stained glass” made from heat-sealed vinyl pouches that hold dyed water inside, and a lighting system to cast shadows. Live Glass, inspired by the stain glass piece on display in the museum, is meant to challenge the way that art is typically viewed. In order to make the artwork feel more alive, the piece will be worn and shown off, casting ever-changing shadows. The user wears the piece around their waist and uses the attached lighting system to cast shadows onto themselves and the floor. The shadows produced by the piece are variegated which adds a new level of complexity and attraction to the piece. The variegated shadows are produced by shinning an led light through the pouches of dyed water. The effect that is created is similar to when sunlight reflects on a pool. Live Glass is to be worn in multiple fashion shows, including one at the Isabella Stewart Gardner Museum, and two for Boston fashion week. An educational exhibit that teaches people about binary communication, by providing a fun and accessible demonstration of how computers encode and send text data. For those who want to learn about binary communication, there are few good options. The only resources available on the subject are jargonistic verbal explanations or convoluted diagrams that are impossible to comprehend without a previous understanding of the material. Water Works focuses on illustrating how computers encode, send and decode text in simple two-way communication. To send a message, the computer converts text character into a unique combination of 0s and 1s; then, on the reading end, the computer reads these values and converts them back to the original message. Water Works consists of two computers sending text to each other via serial binary communication. However, instead of representing each bit (1 or 0) as high or low voltages going across a wire, Water Works sends mineral oil and colored water through a tube, using the clear oil to represent 0s and the water to represent 1s. Through this faithful recreation of the process, the user can learn about the general process, or even learn each individual binary value of the typical typing character. PCB maker: a prototyping device that automates that prototyping Printed Circuit Boards (PCBs) by employing the fast high-resolution methods used in production manufacturing without the need for a large facility and team. All previous solutions for prototyping printed circuit boards (PCBs) have been low resolution, unreliable, and expensive. PCB maker produces PCB by adapting professional manufacturing techniques for use in a device that is inexpensive, small, and fully automated. Using laser Galvanometer to cure UV photoresist, PCB maker creates the positive image of the final copper in photoresist on the board. on the board after which the remaining copper can be etched away with an acid bath. 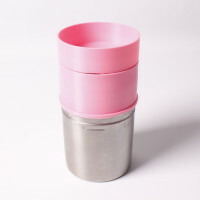 Several aspects of the design have been improved in the new iteration. The electronics for the galvanometer were finished allowing control from an Arduino. A new enclosure was created that incorporates the galvanometer and acid bathing in one unit that fully automated the process by moving the board from a fixture where it is laser cured to different solvent baths for etching.In addition, work has been done to integrate milling so the board can be cut out of the rectangular blank. The file processing algorithm was merged into a desktop application that takes the standard output files for PCB production, creates a rasterization, and converts that to a path for the galvanometer to follow to cure the photoresist and create the copper image. The interactive coffee tables are a project that strive to promote collaboration. They do so by encouraging people to bring their tables together. As more and more tables come together, the colors that light the tables become more and more complex and interesting to watch. For each number of tables put together there is a set lighting effect. When the tables are alone they fade between shades of pink. When paired, they cycle slowly through the rainbow. The lighting of the tables when alone is a balance between aesthetically pleasing and bland. This means despite looking good alone, people are compelled to bring them together. Our project started based on the idea of making these coffee tables using wood, concrete, and acrylic. Along with this, the models our tables are based of used a core and LED strips to light the tables. The sensors in these models were magnetic field sensors placed along the bottom. In our first iteration, we used a frame that allowed acrylic to be placed on all sides rather than just on the top like in the previous models. We did this in an attempt to make the tables more interesting to look at. Along with this, our first iteration did not use a core like the earlier models. This allowed the light to diffuse well and made placement of the electronics simpler. It also provided easy access to the lights. At this point we were planning to make the top removeable as a way to access the electronics. Another key difference between our new design and the older model was the use of NFC sensors instead of magnetic field sensors. These are more reliable and easier to use despite being harder to program. Our next iteration was similar to our first in that it continued with the frame idea but it did have multiple key differences. We increased the height to make the table easier to sit at and for other practical reasons. We also decided that rather than making the top removable, we would make the top and sides a shell that slipped over a base. The base would be where the electronics were placed. When pursuing this design we came back to using a core to house the lights and Arduino. We continued using LED strips for the lights. We prototyped a core and experimented with the lights we planned on using. Preceding this design we made a prototype of a new model that would not use a core but would continue on the idea of using a removable shell. This would be achieved by using a wooden base that the frame would rest on top of. The electronics would sit on the base which would also have wheels screwed into the bottom. The lights would be placed on the side which allowed very even diffusion despite a few bright spots. The lights in this design would not be LED strips but rather single RGB leds. This allowed smooth fades between the colors of the lights. To make the lights easy to access, we would connect them to the Arduino using quick-release wires. In this design we also settled on a placement for the NFC sensors. There would be one on each side placed along the bottom. Our final iteration is similar to previous one with only a few minor differences. It is made using steel pieces for the frame and wood for the base. Using the same concepts for design and electronics, the only difference between it and the iteration that it precedes is the cut out rectangles along the bottom. These rectangles are for the NFC sensors to be placed in. This was an important design feature due to the fact that the sensors would not work through the steel that made up the frame. Our final iteration also uses RGB LED lights. Soft robotics have an incredible amount of potential to create precise movements, that would need many heavy actuators to replicate in conventional robotics. The goal of this project if to examine soft robotic actuation and its ability to integrate into conventional robotics. Soft robotics have some limitations, so harder materials and principals are being incorporated so the hand can perform fine motor skills. Real world applications of this study could include full hand prosthesis replacement, helping to provide grip strength for someone with a partly functioning hand, or even an additional exoskeletal hand for someone who is in a particularly demanding jobs. The hand consisted of three main groupings, the 4 upper fingers that have very similar functions, the thumb and palm, and the wrist. Each of the were fabricated from 3d printed molds and cast in silicone. 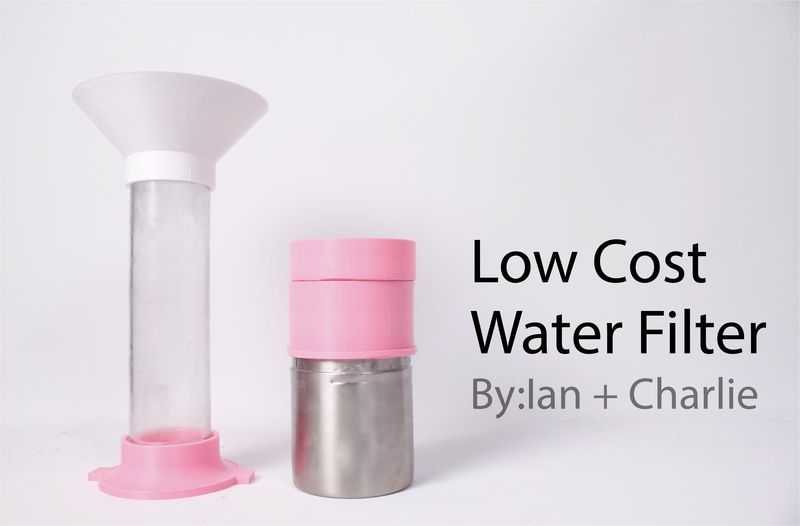 The Low-Cost Water Filter is a filter that can be made out of materials that can be easily found, like clay and plastic containers, in conjunction with an affordable carbon filter. 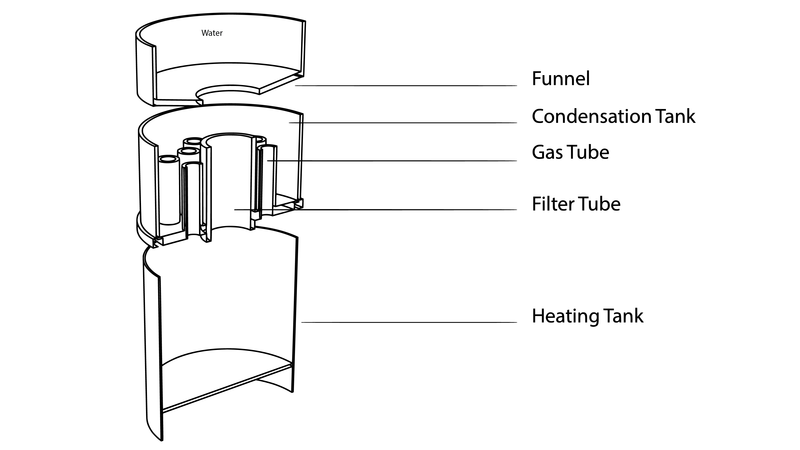 The filter uses filtration and evaporation to filter out particulate matter to produce drinkable water. 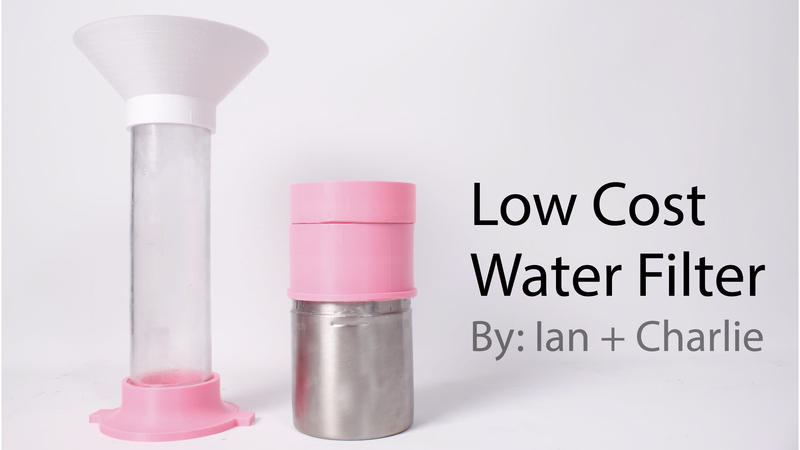 The Low-Cost Water Filter was developed to be used in conjunction with the Low-Cost Water Backpack, which provides people in developing countries an affordable and ergonomic way to transport water from a water source back to their communities. Once there, they can use the filter. 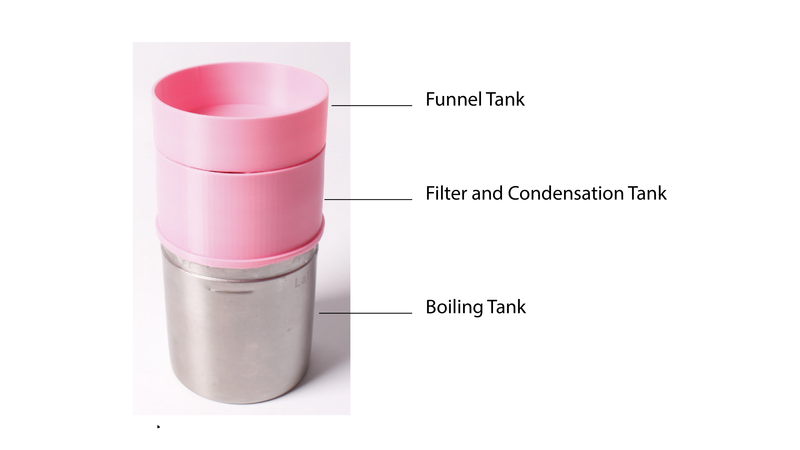 The filter consists of a metal heating tray and two interlocking 3D-printed tanks and uses a two-step filtration system. these three tanks are stacked on top of each other. 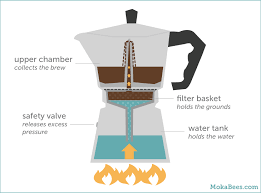 First, the dirty water is poured into the top of the filter over a fire. the water flows into the top of the filter. The water then passes through a series of layers of sand, rock and carbon filters that block any larger particles. 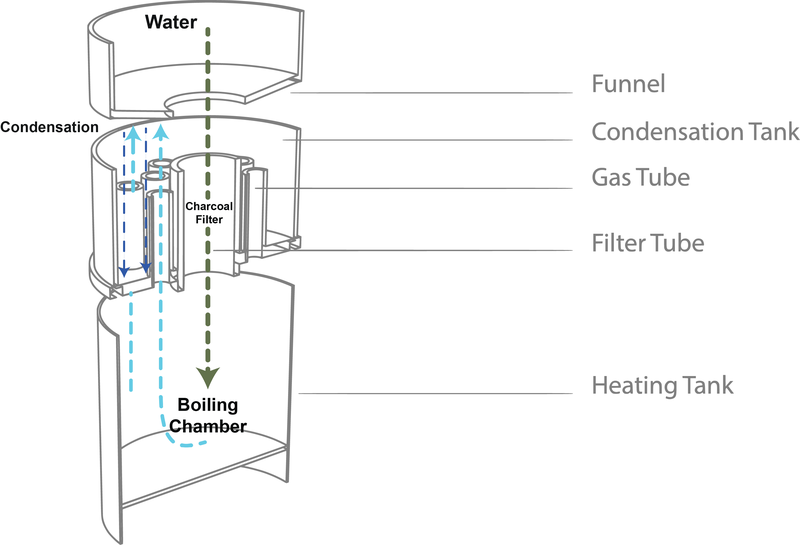 The water is then boiled in the bottom tank and the gas escapes through small holes in the bottom of the middle tank, where the water vapor condenses for storage. 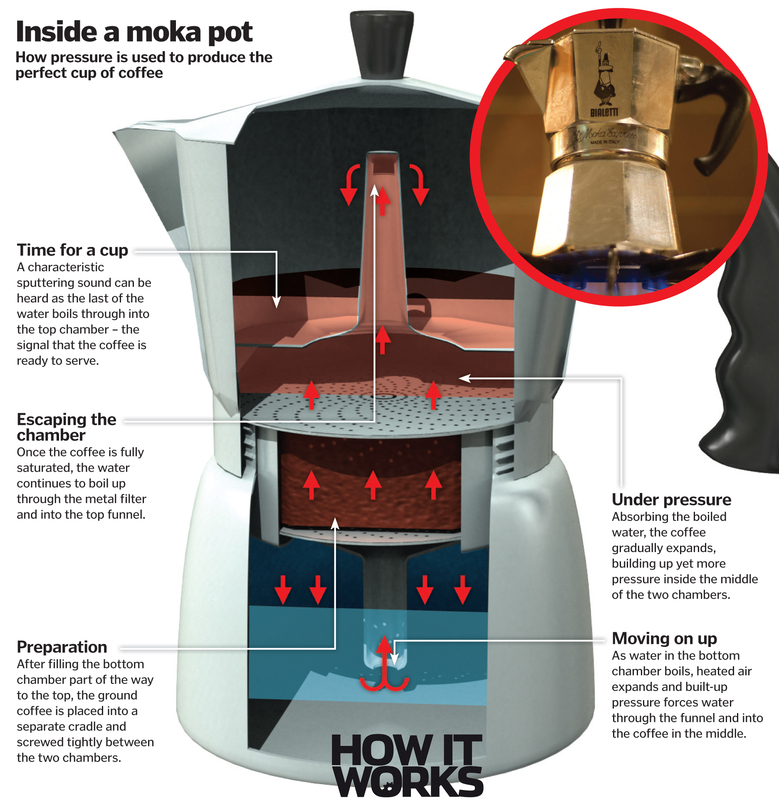 The process of evaporation removes any sub-visible chemicals that are harmful to the human body. 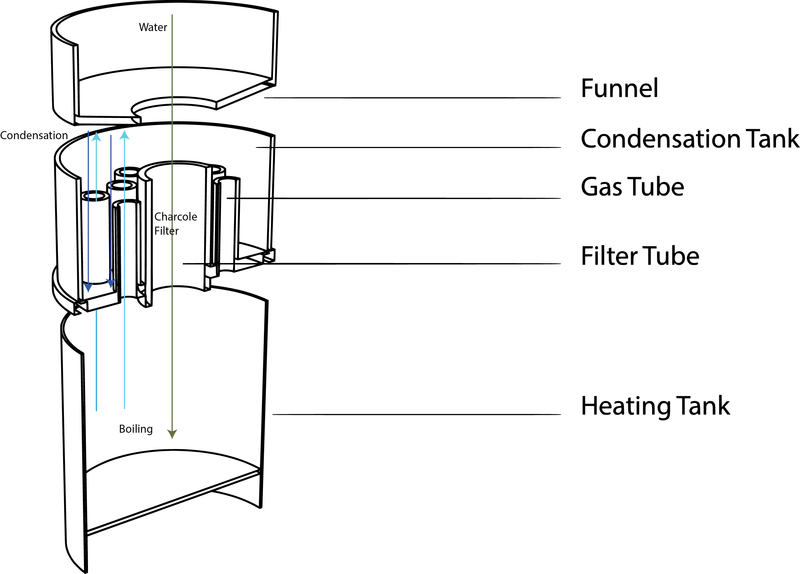 This filter has a versatile design that can be scaled down or up in size, to serve a single home or to supply a whole community with clean water. 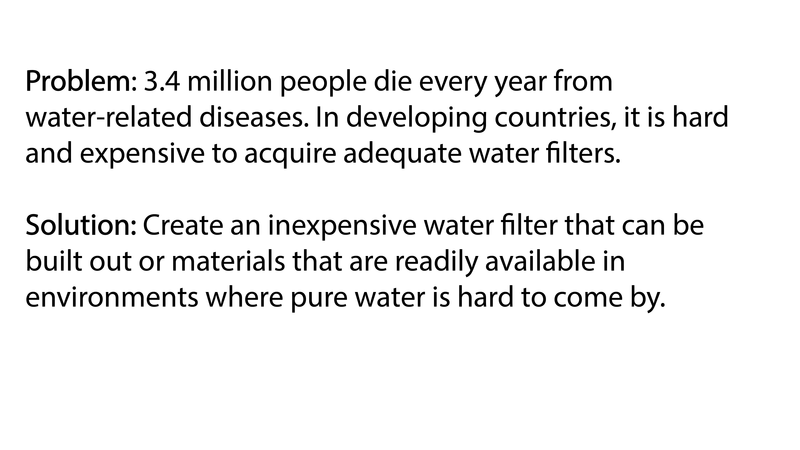 It can help prevent the 3.4 million deaths each year from water-related diseases.